This composite image shows the central regions of the nearby Circinus galaxy, located about 12 million light years away. Data from NASA's Chandra X-ray Observatory is shown in blue and data from the Hubble Space telescope is shown in yellow ("I-band"), red (hydrogen emission), cyan ("V-band") and light blue (oxygen emission). The bright, blue source near the lower right hand corner of the image is the supernova SN 1996cr, that has finally been identified over a decade after it exploded. 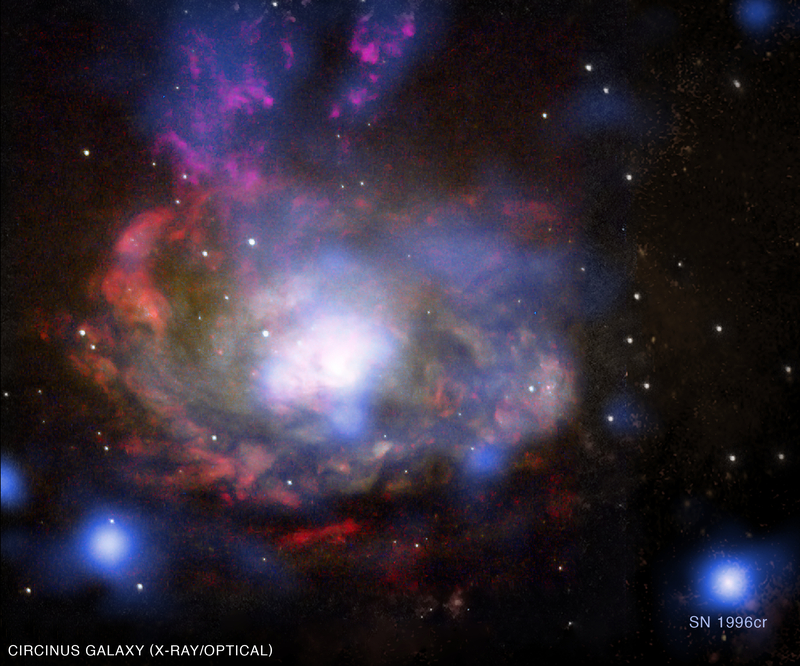 Optical images from the archives of the Anglo-Australian Telescope in Australia show that SN 1996cr exploded between February 28, 1995 and March 15, 1996. Among the five nearest supernovas of the last 25 years, SN 1996cr is the only one that was not seen shortly after the explosion. It may not have been noticed by astronomers at the time because it was only visible in the southern hemisphere, which is not as widely monitored as the northern. The supernova was first singled out in 2001 as a bright, variable object in a Chandra image. Despite some exceptional properties, its nature remained unclear until years later, when scientists were able to confirm this object was a supernova. Clues in data from the European Southern Observatory's Very Large Telescope led the team to search through data archives from 18 different telescopes, both in space and on the ground, nearly all of which was from archives. This is a remarkable example of the new era of `Internet astronomy'. 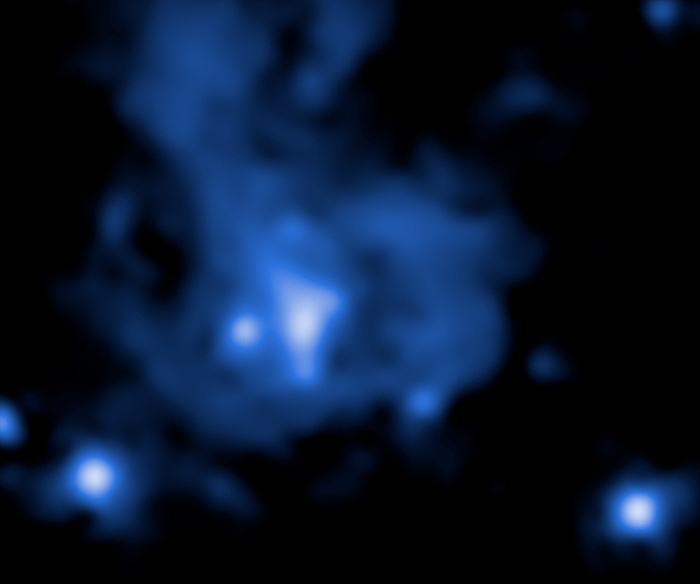 The Circinus galaxy is a popular target for astronomers because it contains a supermassive black hole that is actively growing, and it shows vigorous star formation. It is also nearby, at only about 4 times the distance of M31. Therefore, the public archives of telescopes contain abundant data on this galaxy. Scale Image is 43 arcsec across. Coordinates (J2000) RA 14h 13m 10.05s | Dec -65° 20´ 44.8"